Talk to some of the folks who have already enjoyed "In The Heights" and you're likely to hear them bubble about how different it is. Granted it's all about the Washington Heights neighborhood of Manhattan. And its heart-pounding hip-hop, salsa, merange score is anything but standard Broadway fare. However, at heart, the reason the show resonates with audiences across the board is because it connects the dots we all have in common. It's about home, and family, and a neighborhood, and belonging. Who can't identify with that? Although it bested the best, this is no glitzy, mega-musical with spinning turntables and high-tech wizardry. 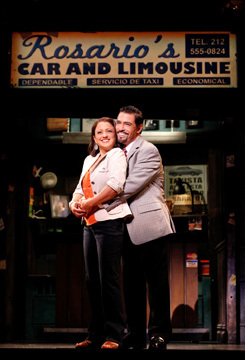 While it does have a highly detailed set (designed by Anna Louizos) depicting a street scene in Washington Heights, the show functions with just that single set. Things don't fly in from the rafters or disappear into the floor with a cloud of smoke. The neighborhood itself serves as a character in the show -- and a constant one at that. As mentioned above, the show's setting is New York’s Puerto Rican neighborhood of Washington Heights, specifically the corner where Usnavi owns and operates a bodega. Named by his immigrant parents for a sign they saw on the front of a big ship (U.S. Navy), Usnavi runs the coffee shop / newsstand with his 16-year-old cousin Sonny. Next door is a beauty salon run by Daniela. Across the way, The Rosarios own the taxi-limo service. Turns out their daughter, Nina, who's been studying at Stamford, is returning home, and they're extremely proud. What they don’t know is, she's returning with a secret. The show gets off to an exhilarating start with the title number, which gives a whirlwind tour of the neighborhood and its inhabitants. What follows is a look at a couple of typical days in the barrio, set against the intense heat of July in the city, complete with a block party, a lottery win, a blackout, looting, love and loss. Despite the specificity of the neighborhood, the longings of its inhabitants are the longings we all share. And their problems are the same problems we all experience. A girl yearns to get up and get out; a guy loves a girl he can't have because her family won't approve; hormones rage, parents sacrifice and lessons are learned the hard way. 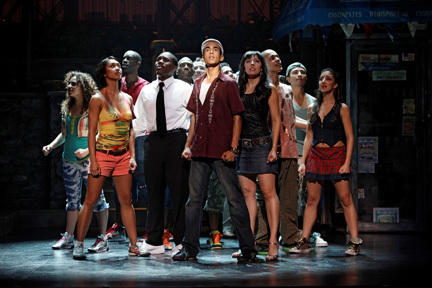 At the center of the story is Kyle Beltran (at left) as Usnavi. He’s likeable, at ease and supplies the real anchor of the show. He’s also heartbreaking when, in Act Two (spoiler alert), he and the rest of his friends have to deal with the death of Claudia. While the script veers more toward soap opera than edgy drama, it’s the music that really erupts to drive the show. In that vein, most of the characters have been supplied with musical moments to tell their stories. As Nina, home from Stamford, Arielle Jacobs is touching in “Breath.” As Claudia, Elise Santora shines in “Paciencia y Fe (Patience and Faith)." Isabel Santiago, as the spitfire Daniela, leads the lively “Carnaval del Barrio.” And the full company gives it their all in "96,000," which is not only nicely staged, but beautifully lit by Lighting Designer Howell Binkley. Daniel Bolero and Natalie Toro at left) are vibrant and proud as Kevin and Camila Rosario, Nina’s parents and owners of the taxi company. In turn, the Rosarios employ Benny, a black guy who longs for Nina. Benny’s played by Rogelio Douglas Jr. who has a voice that soars as it touches the heart. As the Piragua Guy who sells shaved ice drinks from a push cart (and constantly competes with the Dairy Queen truck), David Baida is not only warmly funny but a wonderful singer, effortlessly sliding up and around a couple of rather grand high notes. Yvette Gonzalez-Nacer is Vanessa, all hips and legs, looking for her next big step. And the comic relief for the neighborhood comes courtesy of Shaun Taylor-Corbett who’s wonderful as the cocky Sonny, swaggering like a gigolo one minute and emoting like a slightly misinformed prophet the next. The writer of the music and lyrics (and creator of the show's concept) is Lin-Manuel Miranda, who starred as Usnavi in the original Broadway production, giving the whole thing an intensely personal patina. The book is by Quiara Alegría Hudes with direction from Thomas Kail and crackling choreography from Andy Blankenbuehler. During intermission, I overheard a couple of older audience members comparing the show to “Fiddler on the Roof.” Out in the lobby, younger theater-goers were calling up references to “Rent.” Someone in the aisle mentioned “West Side Story.” All are valid comparisons in one way or another. But "In The Heights" exists as its own animal. While it may employ dramatic license to present a somewhat glossy view of life between 155th and 200th Street, it's still a bright, jubilant and thoroughly charming celebration brimming with heart. And who couldn't use a little of that right now? 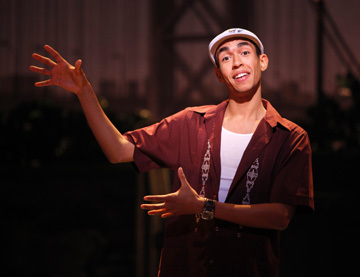 "In The Heights" is at the Boston Opera House through January 24. For information, call 800-982-2787.